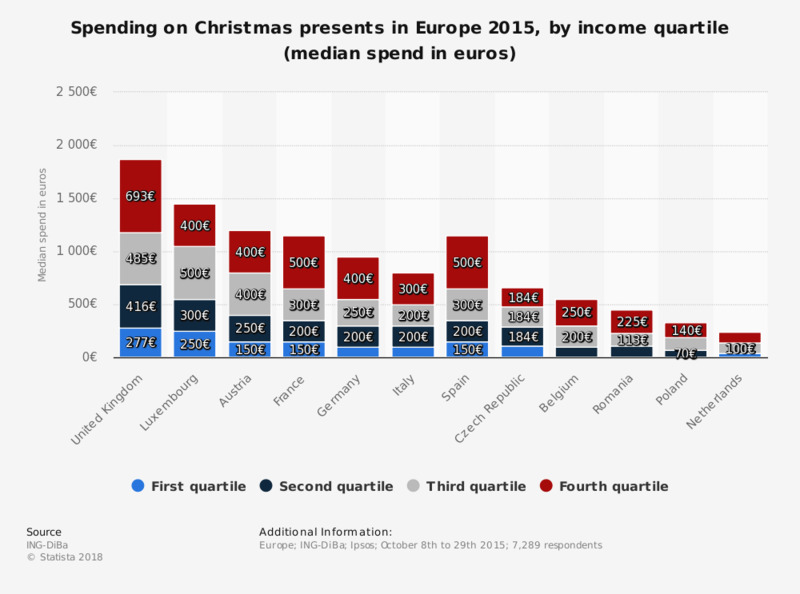 This survey was conducted to assess the Christmas shopping behavior among different income quartile groups in the European region in 2015 by asking the question "How much do you plan on spending this year on Christmas presents?" Ranked by the median planned spend in euros, the United Kingdom (UK) was the leading country with a planned spend of 277 euros for its first quartile. Do you expect to personally spend more, less or about the same on buying presents and gifts this December compared to the same time last year? Which channel do you expect to experience the biggest sales growth this Christmas? Which category do you think will see the best growth this Christmas? When shopping for Christmas, from which of these product categories would you spontaneously purchase something if you came across a good offer? Compared to last year, do you plan to spend more or less on holiday shopping this year? Will you be spending more or less money during this year's Christmas shopping period than last year?